The GSM/GPRS Cellular Module for Microcontrolles/ Embedded Systems/ Home automation is complete in all respect ready to plug-in interface for your microcontroller(Atmega, PIC, Basic Stamp, 8051, AVR etc) with an SIM900 GSM/GPRS cellular module. 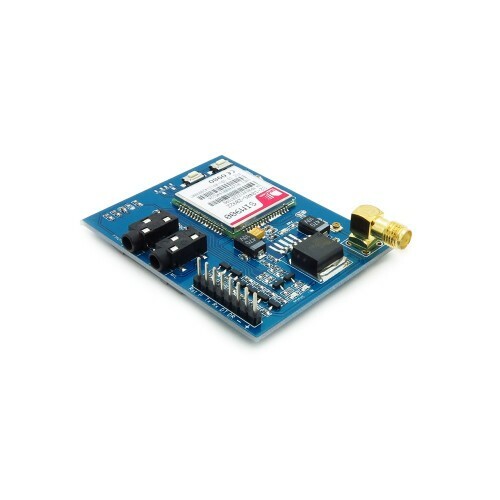 This allows you to easily add SMS, GSM/GPRS, and TCP/IP functionalities to your microcontroller based project. All you need to add cellular functionality to your project is a SIM card (pre-paid or straight from your phone) and you can start sending Serial messages to make calls, send texts and serve web pages! GSM/GPRS module is a breakout board and system of SIM900 Quad-band GSM/GPRS module. It can communicate with controllers via AT commands (GSM 07.07 ,07.05 and SIMCOM enhanced AT Commands). This module support software power on and reset.